I am telling you stories, trust me. That is a line from a Jeanette Winterson novel that has nothing to do with banking. Nothing. All roads lead to banking only in my head. But bear with me. Let me tell you this story. It may make some sense. 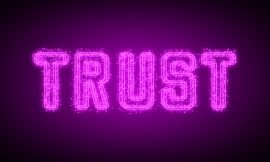 Over the last decade, “trust” is a word that has been bandied about with no reserve or restraint. It has been used to explain why banks survive, on the face of widespread cynicism, fiduciary failures, fines and scandals. It has been used to explain why banks fail, why public opinion turned against them, why fintech firms have their moment in the spotlight, why customers are giving Monzo and Revolut a chance. It has been used as a lance, to attack old ways of doing business and as a shield to defend them. And it has been used to attack new ways of doing business in exactly the same way. Incumbents are trusted where challengers are not. Challengers are trusted where incumbents are not. Trust withheld and trust lacking has become the refrain of our time. But what does all that even mean? Plus it can’t be both. It can’t be all. Incumbents can’t both be trusted and not. Challengers cannot both be trusted and not. Or can they? Trust has been turned into currency. We have all agreed it matters. We have all agreed it is contested. We do not all agree who deserves it. We do not all agree on the mechanics of gaining, keeping or losing it. And even though we don’t all mean the same thing when we say the word, trust has become the name of the game nonetheless. We play up to it. We talk about it. We do and say and build things that we believe will make us more trustworthy. Incumbents are building accessibility, in features and language, in fees and branch design. And challengers are building credibility by getting banking licenses and grey-haired non executive directors. Old school product traits and comfort. We all say it’s all about the customer. Their choice. Their needs. Their love. But mostly, it’s about us looking over the fence at the thing the other guys have that we don’t and trying to build the trust gap with feature parity and copycat user journeys. If you look it up, trust is a belief in the reliability, truth or ability of someone or something. Although we often use the word to mean freedom from suspicion and imply respect, really, all it actually means at its core is confidence that things will be a certain way. Nowhere does it say that this way is good. Sure, the word is used in a manner that ties it tightly to positive emotive responses. Trust is good. And yet. Trust is not about content, it is about mechanics. Trust is about reliability. Trust is about belief in consistency. It is not about love. First Direct may be infinitely more accessible and likeable than HSBC. You can trust it to be consistently friendly in its messaging. That doesn’t mean you will trust it to have better products or trust it with your money. But you will trust it not to fail just the same way you trust HSBC not to fail because it hasn’t for so long and you are reassured they have taken steps to prevent that from happening. And you trust in those even if you don’t like them. And the Revoluts and Monzos of the world asked you to give them a chance because you liked them and they tried to show you they deserve your trust as well. Not as a result of that attraction. Because your love is great. Your trust is greater. Your trust means they are now grown ups. Your love requires interaction. You like the thing so you keep playing with it. Your trust on the other hand entails a possibility of absence. I know this will not fall over if I stop looking. When it comes to banking, being able to let it be, unsupervised while you live your life, and know it won’t fall over, is kind of a big deal. Bigger than love. Trust and love have nothing to do with each other. Sure they can coexist. But they don’t need to. You can trust in the consistency of something you don’t like one bit. No matter. That consistency allows you to plan your life. It allows you to form habits. It allows you to take calculated risks. It allows you to prevent yourself from going crazy. Trust is about non-variability within a sustained range of expectation. Trust is about lack of excitement. Do not underestimate the power of being the thing people don’t worry about keeping an eye on because they know it is rock solid, constant and consistent. So we are doing trust wrong. It is not about friendliness. It is not about love. It is about consistency. It is about dependability. It is about doing the thing in a way that doesn’t surprise. Feel free to delight on top. But don’t forget yourself. Surprises are great when it comes to birthday parties not pension dividends. Delight away. It may make all the difference in market capture. But it won’t win the retention game for you. Challenger or incumbent, trust is about predictability. 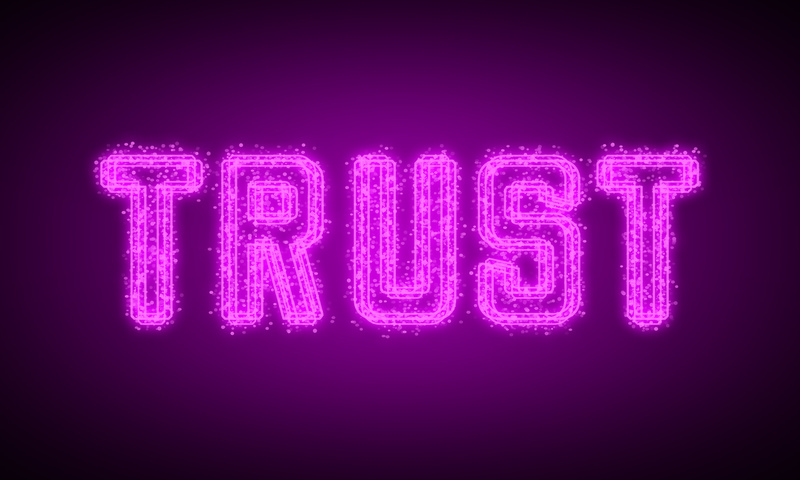 Why did trust become the currency of credibility? Because it is what keeps customers with you. And because when you have it, it tends to renew itself unless you really mess things up. If predictability gets trust, then trust begets trust. And trust gets you runway. To do the things that delight, the things that bring more customers, more custom, more revenue. Trust need to be the unspoken fabric of the wider canvas. Sure you won’t win with it alone. But you are nowhere without it. As a business, in general. Definitely in the banking game where we are, no matter what we do, a “so that” business. A business people engage with ‘so that’ they can live, build businesses, change the world. Nobody engages in banking for itself; we are part of something bigger. People’s lives. Whether it is buying an ice cream or funding the CERN infrastructure. It is never about banking and it is good to remember that. Don’t go firing your UX folks. You need them. Good UX that reduces friction, shows understanding of the life you serve and answers to the worries of your customer is how trust is retained. But really, above all else, trust is gained, kept and maintained through what you do. As a business. Day in day out, year in year out. My bank is consistently there and consistently terrible at customer service. I trust them to act as a custodian of assets but move all my business interaction to other providers who I trust to be aligned to my needs and expectations. Now, if my bank were clever (I fear they are not) they would be looking at their business model and either embrace their utility function or go after my wider business by changing the way they offer, engage and interact. And by accepting that new trust needs to be built on top of the trust they have. For trust is renewable but not transferable. To trust you in A may mean that I will give you a chance in B. But it does not mean that I will automatically trust you in it. I wouldn’t trust my bank to consistently deliver against a new narrative (that’s where innovation efforts fall down, by the way: try explaining to banks that building a stand-alone thing and throwing a press release out there isn’t enough) until they had consistently delivered against the new narrative. Again and again and again. Deserving my trust before I give it. Trust and love are not interchangeable. You trust that death and your tax return will come. You don’t relish either. But you know what the deal is and plan your life accordingly. You trust in your mother’s love. You know it is there even when you don’t look, you rely on it without question. You know where I am going with this. It is about the narrative that emerges through customer interactions. Not billboards. It is about the things you do, again and again and again that truly make up the business you run. Not programmes, projects and peripheral activity. Trust is robust and fragile all at once. It emerges from a million small things and all the big ones. And it builds a narrative of interconnected stuff (your products, services, customer interactions, prices, law suits, regulatory fines, marketing and so on). It is a narrative of interdependent characters and events that build on each other. No customer interaction is a stand alone opportunity to excel. It is always tied to everything else and the trust you have is the trust you built to-date. You are trusted to be consistent in whatever it is you have been consistent in, over the years. Trust is about what you do again and again and again. It is only when you do things again and again that trust renews itself. And a narrative builds. And that is the catch. Trust is about the story you deliver. Not the story you tell. Fascinating take (as always) on Trust. Alan Sieler believes that Trust has 3 components;-sincerity, reliability and competence, and that trusting someone or something always involves at least one of these. Does looking at Trust (in fintech or banking) through these lenses work?